Product Information- Experience the bewitching fragrance of wild mint and rich organic essential oils of neem and aloe. With the moisturizing and sunblock effect of aloe, and deep pore cleansing neem and mint extracts, you can put your worries about pigmentation, sudden breakouts and dryness to rest. 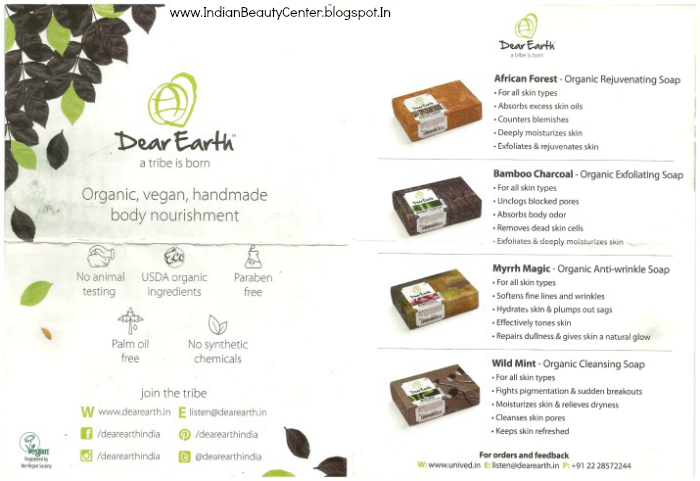 Dear Earth Wild Mint soap will leave your skin cleansed, happy and refreshed. Dear Earth Wild Mint cleansing soap is 100% handmade and vegan. It is a fine blend of pure USDA organic certified ingredients and does not contain hazardous chemicals. It is also free from animal cruelty. Shelf Life- 24 months from date of Mfg. Ingredients- Organic Helianthus annuus (Sunflower) seed oil, organic Cocos nucifera (Coconut) oil, organic Azadirachta indica (Neem) seed oil, organic pungam oil, organic Zea mays (Corn) oil, organic Olea europaea (Olive) oil, demineralised aqua, lye, organic oil extract of Ocimum basillicum (Basil), organic Aloe barbadensis, EDTA, and natural fragrance of Mint and Mentha viridis (Spearmint). I have already finished using this natural soap and it lasted me for around a month. It comes in a lovely outer card-board box and the mint soap wrapped in a paper cover. Once you open it, you can smell peppermint, which is kind of soapy, natural and mild. So the fragrance of this cleansing soap won't bother you much. The soap is of a good size and will last you a month, if you use it only for the facial skin, twice daily. The soap will last you for more than 15 days, when used on the body, everyday! Thus, the size makes up for the price you pay. The soap lathers really, really well and two swipes over an area are enough. Thus, the soap lasts better because it does not melt away too quickly and within a few swipes, you can build up a really decent lather. The soap glides on very smoothly onto my skin and cleanses it deeply. I have used this soap both on my face and body, as I has divided the soap into two pieces. Yes, as a facial cleansing soap, this is only for oily skin as it dries out the skin, removes all oil, dirt and leaves the skin totally refreshed and dry. It does dry out the pimples but does not help in preventing eruptions. As a body cleanser, it does remove all oil, dirt and leaves behind dry, fresh and happy skin, that glows! As this is a organic, hand-made soap, it does not harm the skin and I love the low that it imparts. Overall, this is a really decent natural organic skin care soap and worth a try! It does its job pretty well but do remember to use your favourite moisturizer after using this. I think, I would be purchasing the other soaps and try those out too! It is paraben free and contains no SLS either- so a good choice for those with oily, acne prone and sensitive skin. 4) Acts as an excellent body cleanser and removes all dirt and oil. Final Verdict- Overall, this is a really good soap and worth the price you pay as you can use it both on your face and on the body- acts nicely both ways! I liked this organic soap and would like to recommend it to you too! If you have dry skin and are using this then do not forget to use your favorite moisturizer. If you have oily skin, you'll love it the most. Normal skin will like it but moisturizer is a must. Combination skinned girls will need to use a light moisturizer too. My final words would be that- This is a great hand-made soap, worth buying. Sounds nice! I love natural products too! Wish it could help with pimples. Sounds good, would like to try it but I'm pretty sure that we don't have it here in Latvia. Sad but you know, that's why I should similar products.